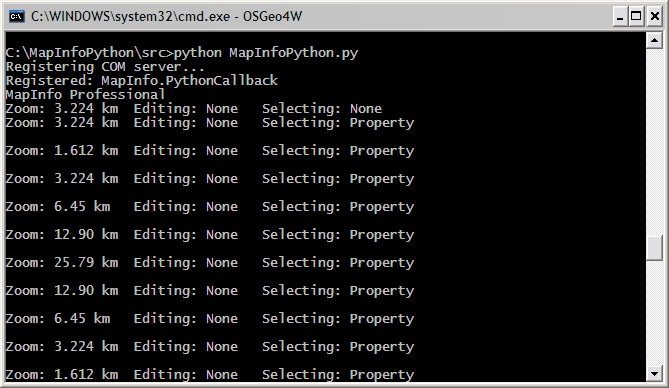 The other day I posted an entry about using MapInfo with Python and Qt (see https://woostuff.wordpress.com/2011/03/05/mapinfo-map-control-into-qt-python-form/), one big thing that I missed was support for callbacks, which if you want to do anything related to integrated mapping is a must for map tool support. The “final code” block doesn’t include the calls to Dispatch() and SetCallback(). I was looking at this because I’m trying to set up a Python script which could handle events from MediaMonkey. In the MM forums, the consensus is that MM has done something wrong and is failing to provide events to out-of-proc objects. So I was looking deeply into the sources for win32com to see if I could work around (answer: no, or not yet anyway). The mapinfo object is a proxy that both exposes the methods of MapInfo.Application and receives the events; the ‘self’ of the event methods is the mapinfo object. A potential wrinkle, which again I don’t understand well, is that Python may not properly cause event propogation if the script is not repeatedly calling pythoncom.PumpWaitingMessages() in a background thread. I’ve seen a couple of examples implenting this kind of feature, but it’s not clear to me whether it’s required (as the IE example doesn’t do anything like that).